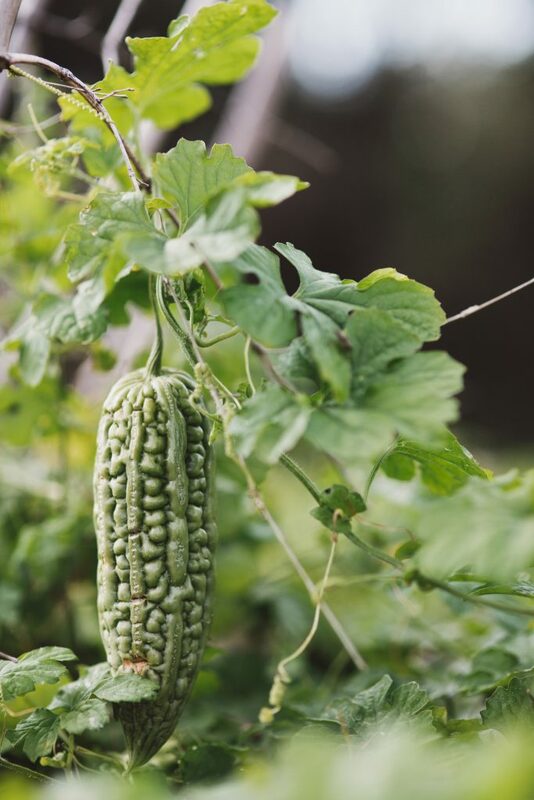 Bitter melon, or as Thomas Jefferson would have called it – balsam pear – is among one of the most unusual Asian vegetables to grow and taste. The 8-10 inch, light green, oblong fruit is recognizable by its bumpy appearance. It also has a distinctly bitter taste. Recently, bitter melon has received a lot of attention for its many health benefits. From helping with weight loss, curing skin afflictions, preventing cancer, treating HIV, regulating menstrual cycles, to relieving constipation, you can see why the bitter melon is dubbed “magic melon”. Although most of these claims are have not been substantiated, there has been scientific research done on the use of bitter melon to treat diabetes. Most people I’ve met who are using bitter melon for nutritional benefits find that it helps regulate blood sugar. Apparently there is a component in bitter melon that acts like insulin. A few diabetics have actually told me their doctors or nutritionists have encouraged them to try eating or juicing bitter melon. Please do speak with a health professional if you have questions about how bitter melon can help you. Preliminary research does explicitly state that bitter melon should not replace insulin or hypoglycemic medications. Here’s the real secret about bitter melon – people in Asia have been enjoying it for hundreds of years – purely for its taste alone! Though I did describe it as bitter, people further describe the bitterness as cooling and refreshing. You may like it or hate it, but it’s definitely worth trying once! Bitter melon can be stuffed and steamed, pickled or added to soups, but in Chinese cuisine, it is most often stir-fried along with foods with other strong tastes such as garlic or hot peppers. These intense flavors help to balance the bitterness of the bitter melon. Most of my Asian friends tell stories of how much they despised bitter melon as kids, but how they acquired tastes for it and now even crave a good home-cooked dish featuring bitter melon. Bitter melon is easy to prepare but it is important to know which part of the fruit to use. Want to learn more? Come visit me at the Heritage Harvest Festival in The Garden Tent from 10:30-11:30. I’ll demonstrate how to cut open and prepare the bitter melon (and many other vegetables) and also talk about a really kooky transformation bitter melon goes through when it becomes overly mature. I’ll also be signing The Chinese Kitchen Garden books at The Shop Tent from 11:45-12:15. See you on the mountain!